Tim Schouten's "Spirit Lake Project"
Tim Schouten’s 2014 exhibit at Gurevich Fine Art Spirit Lake Project is a continuation of his work from the ongoing Songs from Spirit Lake collaboration, started in 2010. It is a series of encaustic paintings reflecting on contemporary life on the Spirit Lake Reservation in North Dakota. In 2010 Schouten was commissioned by the North Dakota Museum of Art in Grand Forks, ND to create a series of paintings reflecting on contemporary life on the Spirit Lake Reservation in North Dakota. He was one of six native and non-native artists engaged for this project by Laurel Rueter, Director and Curator of the museum. Laurel, a non-native, grew up on the reservation. Her brother Russ, to this day lives and farms on the reservation on allotted land. Schouten was invited to this project on the reputation of his Treaty Lands Project. Ongoing for ten years the project reflects on the nature of landscape, history and the Numbered Treaties in Canada’s Central regions. Songs for Spirit Lake was first exhibited at the Rauschenberg Project Space in New York City and at then at Cankdeska Cikana Community College on the Spirit Lake Reservation to excellent reviews. The show is now on view at North Dakota Museum of Art until April 27, 2014. Schouten spent the past four years travelling to Spirit Lake Dakota Nation and living off and on there for short periods getting to know people and searching for ways into this project as a non-native Canadian artist. He had never lived on or even visited an American reservation before. He had only a passing knowledge of American politics, history and geography and the American Indian Movement. Schouten’s encaustic pieces are unflinching and determined in their presentation. Typographic and landscape works highlight his experience of how life is lived today, stripping away nostalgia, racism, and history-based anger. The work considers the joys as well as the difficulties faced by northern reservation inhabitants. 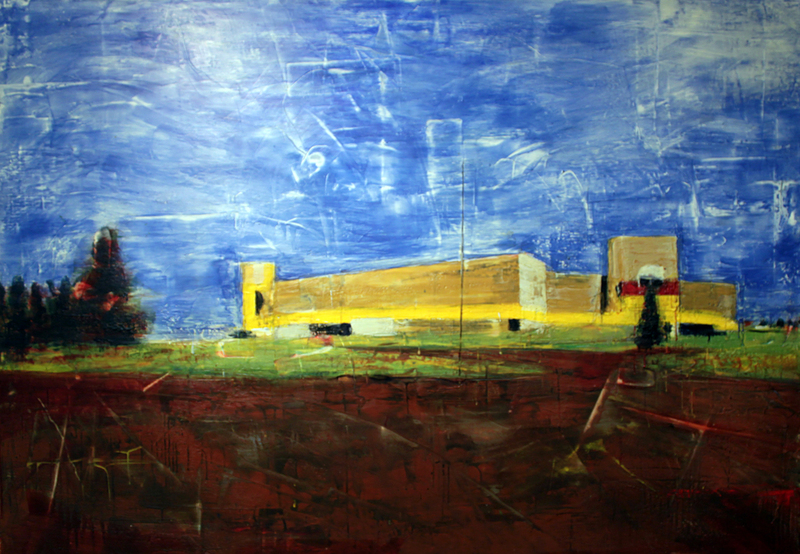 His large encaustic paintings survey the Spirit Lake Reservation’s Northern Plains country. It is this contrast that makes Schouten’s work illuminating and heartbreaking at the same time. “Before Songs for Spirit Lake no contemporary art had ever been created on or about Spirit Lake,” explains Laurel Rueter. Schouten’s pieces attempt to depict the people and their patterns of intermingling the past and present through art. The exhibit invites a new, broad audience to engage with the voices and traditions of the Spirit Lake community as viewed through his eyes. More info about Songs for Spirit Lake here. Newer PostMilos Milidrag's "Forgotten Flowers"
Older PostToby Bartlett in collaboration with Rylaan Gimby, "DVD Family"